As I sit in front of my fireplace on this cold winter night, I get lost in the dancing flames. My eyes are glued to the red and orange sparks and my ears to the sound of the crackling logs. I look around and see the smiles of my family and friends as we feel the warmth of the fire. I let my mind drift back to summer. I am lucky to be able to spend my summers at Camp Tevya, a Jewish overnight camp in Brookline, New Hampshire, that is part of the Cohen Camps family. Each summer campers come together to learn new skills, enjoy making forever friends, gain life lessons and understand the meaning of living as a community. And of course, they have fun! Our campers are always engaged in creative daily activities and special events. As action-packed as our days are, there is something special about the evenings at Tevya when we come together as a whole age group or as an entire community. The magic of a Tevya campfire makes this a favorite evening activity, as we relax and feel the spirit of Tevya with songs, stories and, of course, s’mores. I walk with campers as they stroll out of their bunks with towels slung around their shoulders. The soles of their sandals drag as they cross the pavement and make their way to the tree-lined dirt path leading to the beach. The flickering light ahead bounces in and out of view through the surrounding pines. They have friends to their left and friends to their right, talking about nothing important, but hanging onto each other’s words like they’re precious life-giving oxygen. The dirt path dips momentarily and then rises as the campfire comes into full view. It’s still 40 feet away, but I immediately begin to feel its warmth. Smoke billows from the playful fire and disappears into the evening sky. The beauty of our colorful sailboats on Lake Potanipo is its backdrop. 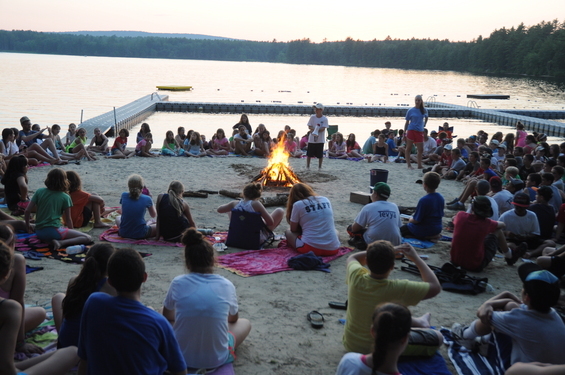 There is a purposefully drawn circle in the sand around the fire indicating the safe sitting distance, and clusters of campers and counselors are sitting around the circle’s edges. The counselor leading the evening activity is quietly strumming his guitar as he paces around the fire. Another counselor adds more wood (or “fire food” as he calls it) to the fire. A third counselor prepares rows of graham crackers and chocolate waiting to bring the s’mores to life. Camp Tevya, like all camps, has its share of legends – stories that have been told and retold around the campfire throughout the years. The stories have been told so many times that the characters become a part of the camp culture. No one knows for sure how the stories originated, just that they have always been a part of camp. Minor details and characters may have changed through the countless retellings, but the main elements of the story remain the same. Everyone has their favorite version of the story and this year, like every year, the storyteller insists that he has the “real story”. Still smiling from the memory of a Camp Tevya campfire, I return my focus to the fire in my fireplace on this winter night. I keep smiling, knowing that in just 175 days, I will once again be surrounded by friends, sharing camp songs, stories and s’mores on the shores of Lake Potanipo.